The following is a guest entry from Cause Inspired Media. As of January 1st, 2018, Google’s new policy changes have taken effect. 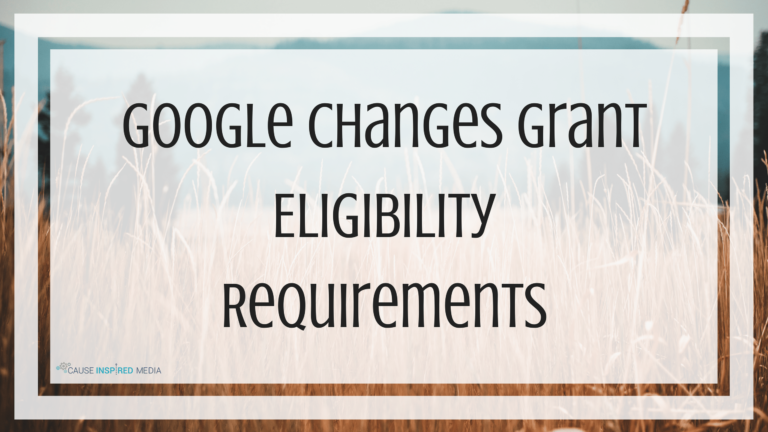 We have outlined the new policies that are most likely to impact your Google Ad Grant account, and what to do in the case of a violation, and subsequent suspension from the Google Ad Grant program. The Google Ad Grant is one of the most valuable and underutilized tools that nonprofit organizations have. A $10,000 monthly advertising credit can go a long way if you know how to use it, and in our experience, we have found that most nonprofits and marketing agencies have trouble managing the Ad Grant effectively. Due to the specialized nature of the credit and Google’s evolving policies, anyone using this philanthropic advertising platform should be ingrained in the specifics of the AdWords software, the nuances of the nonprofit landscape, and grant policies. In January, Google made the most sweeping changes to the Ad Grant program since they started in 2003. Due to the vast changes, many organizations’ Ad Grant accounts are at risk of suspension. What are these changes? And what should you do if your account gets suspended for a policy violation? Automatic Suspension for Discrimination: This has slowly been implemented already. Google has disapproved keywords and ads related to any discriminated groups regardless if it is negative or positive. This change would mean that if Google finds you in violation, they will suspend your entire account. This new policy codifies Google’s anti-discrimination policies to be specific to the grant. 1. Single-Word Keywords (ie. ‘car,’ ‘yoga,’ ‘boat’): Google’s Ad Grant Team has designated any keyword less than two words (excluding your own branded terms), too generic for the use in the Ad Grant program. 2. Overly Generic Keywords: As an extension of the single-word rule, Google is requiring your keywords to be targeted so they reach a subset of users, rather than users searching more broadly. For example, bidding on the word ‘ebooks’ would be too broad of a target, however, if you were to bid on the phrase ‘ebooks about philanthropy’ and land the user on a page for ‘ebooks about philanthropy’ on your website, Google will consider this acceptable. 3. Quality Score Under 3: The AdWords program uses an algorithm that uses impression data to assign a quality score between 1-10. Your quality score is made up of expected click-through-rate, ad relevance, and landing page experience. Any score under a ‘3’ in your account must be paused or your account can be suspended until those ads are removed or optimized. Website Policy: This update simply outlines that your mission and services need to be clear from the content on your website. Google now requires that nonprofits own their own “high-quality” website with limited on-site ads. Commercial activity must also not be the sole purpose of the website. Performance Requirements: This, in addition to the new bidding option called “Maximize Conversions,” is the most significant policy change by far. Previously, there weren’t mandatory performance requirements unless you had the (currently unavailable) Google Grant Pro. However, there are many nonprofits and agencies that simply do not keep up with their Ad Grant accounts, and consequently have very low click-through-rates (CTRs). To combat this, Google has updated their policy so that nonprofits are required to maintain an overall CTR of 5%. If your account has been suspended for not reaching 5% CTR on or after March 1st, you must demonstrate to Google that you have made sufficient changes to your account in order to show that you are likely to reach the 5% CTR benchmark in the coming month. Annual Survey: This new requirement is actually a step backwards in time. Grant accounts used to either have to reapply annually or, in the case of Pro accounts, answer a survey. Now all Ad Grant recipients are required to answer a detailed survey by March of 2018 in order to maintain access to their Ad Grant. This will repeat annually from this point forward. Most of these policies are relatively easy to abide by on the surface, as long as you are actively managing your account. However, sometimes in order to adhere to these new requirements, eliminating otherwise well performing keywords can lower your engagement rates and total monthly AdSpend. With this in mind, it is important to have a partner that understands and has the experience to find new ways to optimize the Ad Grant program to help your nonprofit. As the Ad Grant program becomes more and more complicated, the best resource you can have is an AdWords specialist. You can locate Badged Partners here . While most of these are focused on for-profit companies, some like Cause Inspired Media are entirely focused on optimizing the Google Ad Grant for nonprofits like yours. As mentioned, Cause Inspired Media has a deep understanding of Google Ad Grants and has already helped over 220 nonprofits adhere to Google’s new policies, including TechBridge. If you’re concerned about losing the Ad Grant for your nonprofit, please reach out to us and we will help. As noted, timing is essential so do not delay, as many of the changes needed to comply will take time.